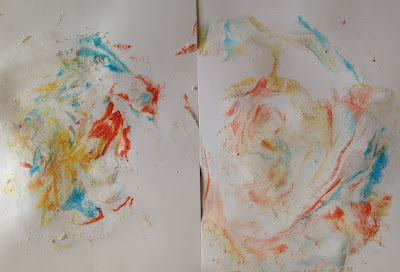 I was feeling brave enough to try marbling with Jessica using shaving foam and liquid watercolours at the weekend. It sounded like fun and it was (to some extent) but we weren't very good at it. Reading up on an article about the process on The Artful Parent it would seem that I missed out a crucial step. I neglected to scrape off the foam as soon as we'd taken the print. This has resulted in a bit of a sticky mess but I'll know better next time I suppose! 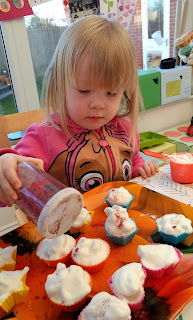 We filled a craft tray with shaving foam and dripped some liquid watercolours on top. Using a cocktail stick, Jessica swirled the colours around a bit and placed the card lightly on top. At this stage I should have scrapped the foam off using something like a palette knife but I just left them. When I came to remove the partly dried foam it was sticky and has proved difficult to remove; you can see the residue on the picture. Having given up on this craft fairly quickly I gave Jessica some of her cups and spoons and let her just play. 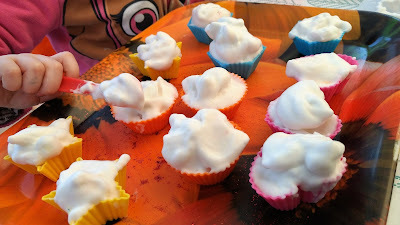 As she stirred the foam it became nice and stiff, much like beating meringue. She said it was like icing, which gave us the idea of making shaving cream cakes. This was great fun. Jess filled her silicone cupcake cases with the thick foam and then sprinkled them with glitter. 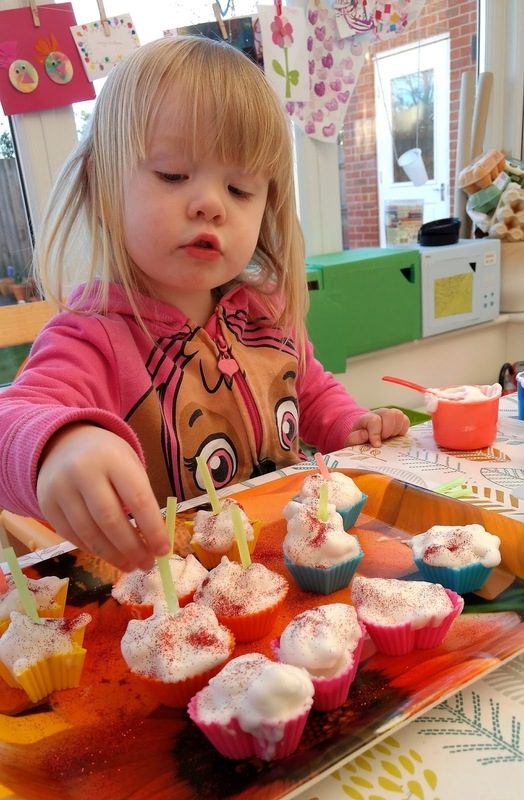 She cut up some straws to use as candles too. I love it when great ideas just emerge from our play! 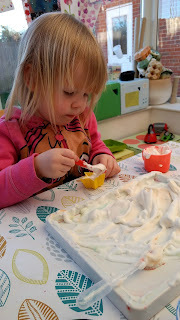 We'll definitely be making a mess with shaving foam again!